The range of automatic Bushnell telescopes offers state-of-the-art computer driven, location and tracking capability all at the push of a button, and is suitable for both the novice and serious astronomer. This series comes with a data base of 20,000 celestial objects.You only need to call up your target on the hand-held control module, enter a simple "Go To" command and the computer completes the task. As soon as you have locked on to your target, tracking the object for extended viewing is automatic, and the revolutionary RVO (Real Voice Output™) feature offers a enjoyable, interactive means to investigate the night sky. The remote control module features red backlit push buttons, red illuminated LCD read-out for easy viewing all without impairing your night vision. Onother useful feature is the new 1x wide-angle, red dot finderscope. 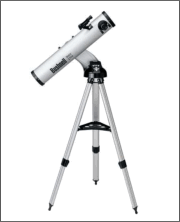 Which Bushnell Telescope Do You Use? 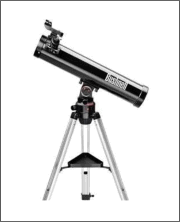 Additional features include a quick-release tripod and accessory tray for fast, easy assembly and comes in your choice of Newtonian reflector telescope of Maksuktov-Cassegrain design with kinematic mount. Now at last you can bring the marvels of the night sky, directly to your back garden with what many are calling the ultimate first telescope. Its illuminated smart mount points the way as the talking handset describes constellations and planets, and keeps you engaged with entertaining facts and mythology and other tidbits. Keeping pace is easy with the LED red dot finderscope. With this great scope you can become an instant expert. Even if you're a complete beginner you can immediately appreciate the wonder of the Planets, Stars and Galaxies. There are a couple of kellner 1.25" diameter high quality multi-element eyepieces available in 9mm and 25mm, and a 2x Barlow lens which will effectively double the magnification of your eyepiece. A camera adapter is for the astro photgraphers among you, this is for use with low-power eyepieces. And if you want your images to display the right way up there is a high quality multi-element 1.25" diameter accessory that flips your images upright. The Bushnell Voyager Telescope has currently four models in the series. The 60mm and 70mm which are refractor scopes and the 76mm and 114mm these are reflector scopes. The Northstar enables you to explore, identify, and also take tours of amazing objects in the sky. With great educational information provided all at the push of a button.